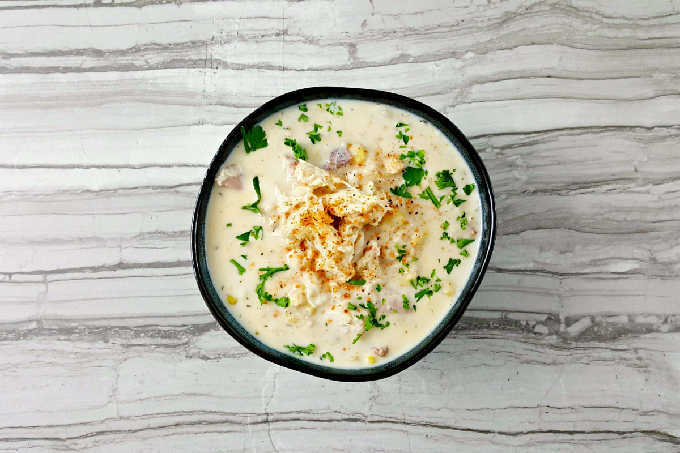 Bayou Crab Chowder is bowl of Cajun flavored deliciousness. There’s hearty potatoes, sweet corn, smoky sausage, kicked up Cajun spices, and finally succulent crab in this seafood Cajun party in a bowl. Do you ever get cravings for food? I mean serious craving for food? Because I do all the time. And I would really like to know that I am NOT alone in this. Am I? Like, do you get a craving that’s so bad that it’s pretty much all you want to eat or can think of eating until you finally eat what you’re craving? No? Just me? So, I got this craving for crab. I have no idea where it came from. I don’t usually crave crab but, for some reason I had a serious craving for crab. But not just any crab. I had a craving for crab soup. So, I made some crab soup. Actually, I made a chowder, but why split hairs, right? This is the second attempt at making this soup…er chowder. I just have to say that it is really important to make sure that you have good crab. So, before you even start to make this recipe make sure that you have purchased a good container of crab. In the first batch, it truly wasn’t that good. It had that fishy taste to it which means to me that it wasn’t all that fresh and it just DID.NOT taste good at all. Yup! I’m one of THOSE people. Those people who can’t stand fishy flavors which is why I don’t like a lot of different types of fish. I stick to mainly cod, haddock, tuna, and swordfish. LOVE swordfish. Hmmm..I should order some fish for this weekend. That sounds like a great idea! Now, I mean no disrespect to canned crab in the canned meat aisle of your grocery store. Trust me when I say that. I use that canned crab often. It’s perfect for my Quick Crab Stuffed Mushrooms. It’s crab that you can keep in the pantry all the time. It comes in handy for appetizers, dips, and for stuffing vegetables or meats. So, trust me when I say that I love that kind of canned crab. It’s just not the type of crab for this soup. 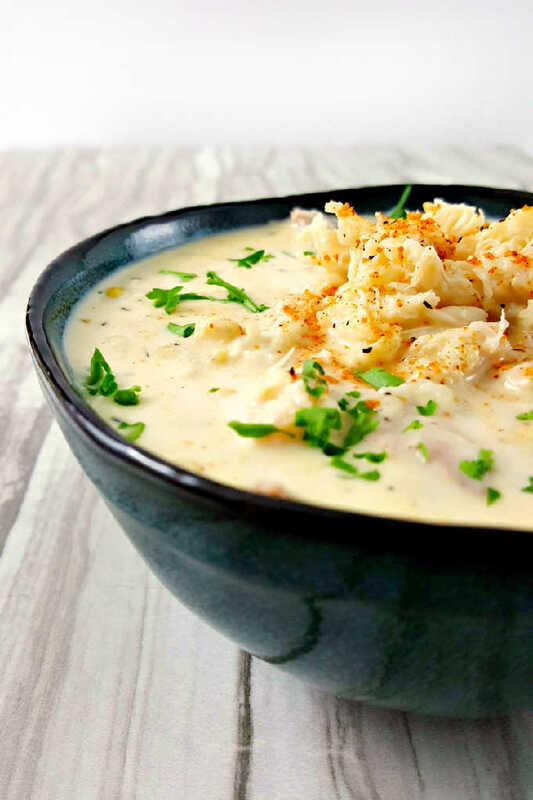 For this soup, you will need to head to your seafood counter or the seafood section of your grocery and purchase a pound container of lump crab meat. 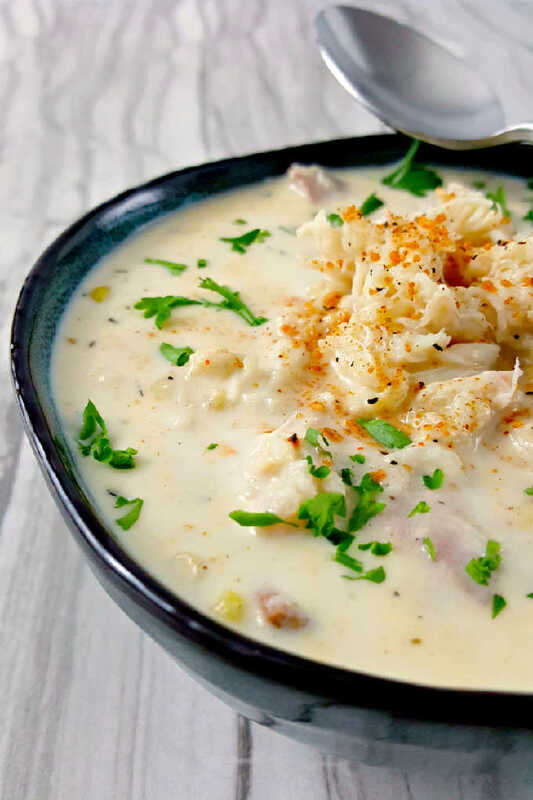 It’s sweet, tender meat is perfect in this delicious chowder. And considering there’s a pound of it in this chowder, you’re going to want it to taste like amazing crab. Since the rest of the ingredients in this chowder are SUPER cheap SPLURGE on the good crab. I made this chowder on a weeknight. Bet ya didn’t know you could do that didja? Well, YOU CAN! I purchased some convenience foods for it, but you really don’t need to do that. With a little prep work the day before, this is a snap to whip up in no time for your family. But for me, I’m lazy on the weekends and didn’t feel like peeling the potatoes, so I purchased the Ore Ida steam and mash potatoes. Now, I’ve never made these. I’ve never eaten these and I definitely haven’t cooked with these, but since they were the only frozen potatoes I could find, I was thrilled to give them a try! They’re a little bigger than I wanted in this soup, but that’s okay! I LOVE potatoes! Hello, I’m Irish ya know! Me and taters are like BFFs and I totes could eat them DAILY and not get tired of them. So, having spoonful sized pieces of potatoes in this chowder, to me at least, made it hearty and perfect for a weeknight meal. And since I have an extra bag in the freezer, I’ll have to try that steam and mash thing to see how it pans out. I’ll keep ya posted. There’s another reason why I was thrilled to try these potatoes; I wanted to have some that I could smash to make for a thicker soup without all that fat. For those new to my blog, the hubs has a serious cholesterol issue that’s hereditary. No matter how little fat he eats, it just turns into the bad stuff. So, I always try to keep our fat counts down in all my recipes. It helps him with his cholesterol and sort of helps me with my weight issue. Now, tell me that looking at that bowl that it’s going to be bland even with the lack fat!! You can’t, can you? There’s a little hint of bacon in there – center cut mind you and only a few slices at that – there’s turkey kielbasa, sweet corn, and then the crab. That sweet, tender pieces of seafood goodness just perched on top as a garnish and a full spoonful in each bite! 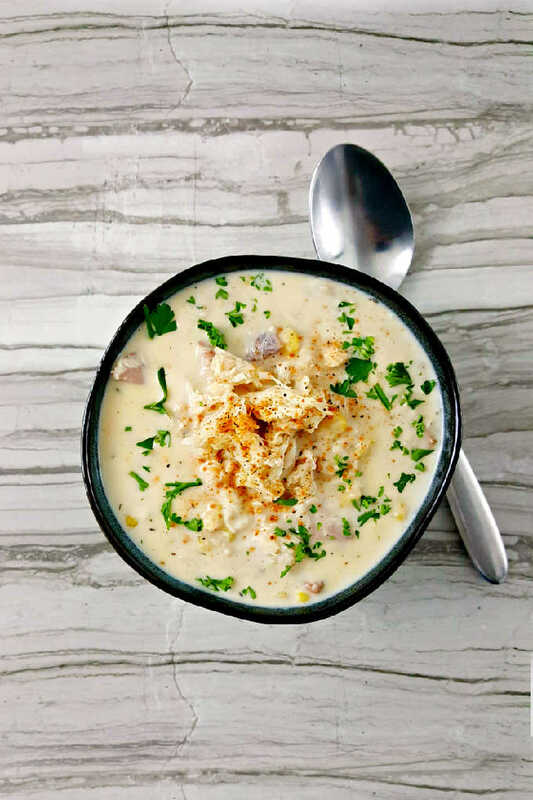 Trust when I say you will not say, “Where’s the crab?” in this chowder. And if you’re one of those that don’t like a lot of crab – yeah, I don’t know who those people are either, but I’m sure there’s some out there. Some like me who doesn’t like salmon but with crab. If you’re one that doesn’t like a lot of crab, put half a pound in and make cakes, my mushrooms, or some other crabby chowder with the rest of your can of crab. *I* put the whole pound in. I wanted it to taste THAT crabby. What do you like to make with crab? 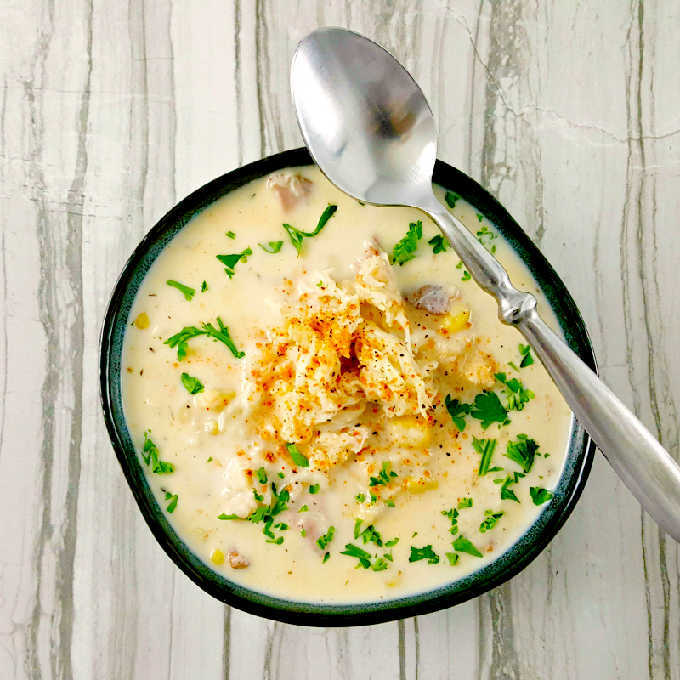 Are you a chowder or a soup person? Heat a large pot over medium-high heat. Add the bacon and cook until crisp. Stir in the next seven ingredients (potatoes through black pepper) and bring to a boil. Simmer until the potatoes are heated through. For a thicker soup, use a potato masher to coarsely mash some of the potatoes before adding the sausage. Cut the sausage in half and then slice in a diagonal. Stir the sausage into the pot and continue to simmer until heated through. Stir in the half and half and all but 1/2 cup of the crab meat, simmering until it comes to a simmer again. Ladle into bowls and garnish with remaining crab meat and a sprinkle of Cajun seasoning and serve. Can you use imitation crab meat? Sure thing! The texture might be a little different, but I can’t imagine why not. I’m not quite sure what the “trouble” is you’re having. If you cannot find turkey kielbasa, then use whatever sausage you prefer. I use turkey kielbasa or sausage for health reasons. What kind of frozen potatoes do you suggest using? I used diced potatoes from Ore Ida, I think. You could easily use Simply Potatoes and cut the cooking time for them as they’re not frozen. Any diced potato will work. This looks so amazing, but I don’t like potatoes. Do you think this would turn out ok without them? Would it be too watery? It might be. I did use them as a thickening agent in the soup. You might try a slurry to thicken it or maybe some navy beans? Just thinking out loud. This chowder turned out GREAT! It had the perfect consistency, seafood taste, and heartiness. Thank you so much for the amazing recipe!! Thank you for the glowing review! I’m so happy you like it. Absolutely great easy to make chowder! Due to lack of decent crab availablility, and cost here, we used 1# Crawfish tails and 1/2# medium shrimp. It turned out great! Added Earl Campbell sausage and 1/2tsp of “Slap yo Mama” seasoning to kick it up a bit. This has quickly become a family favorite thanks again! Been looking at this recipe for weeks.. finally made it. AWESOME! I cant make a soup w/o onioms, so i sauteed one in small pieces after cooking 6 pieces of bacon. Some advice, only use quality crab. Prefer fresh, or refrigerated pastureized. Lump is perfect, but to save a few pennies, could use backfin. NEVER canned that is shelf stable.ie Chicken of sea. Complete junk. Also, dont use big box store, (walmart etc) youre making this to celebrate our culture, support local. If u need advice, independent grocers are way to go. I’m so glad you liked it Wayne! It’s one of our favorites. And I agree on the quality of your crab. Glad you like it! Please tell me what Turkey Kebadsa is we have many fantastic meat, seafood and fruit and veggies here and some items in your recipes I know the Ozzie equilivent but some stump me. I am going to use a local (huge) crab called a muddy, it will give me about 2.5lbs of meat. Enjoy your recipes especially your Cajun and southern recipes. Turkey kielbasa is a turkey form of a Polish smoked sausage or Polish sausage. Hope you enjoy the soup! I want a bowl of this right now! I can see why this was the most popular. Yum! I’m seriously salivating dreaming of this soup! I have never made something like this before at home but always order seafood chowders when I go out. Time for that to change! It’s worth it to make it. It’s so creamy and delicious. I am loving everything about this chowder except that there is none in front of me, right now! Beautiful job with this delicious-sounding recipe. 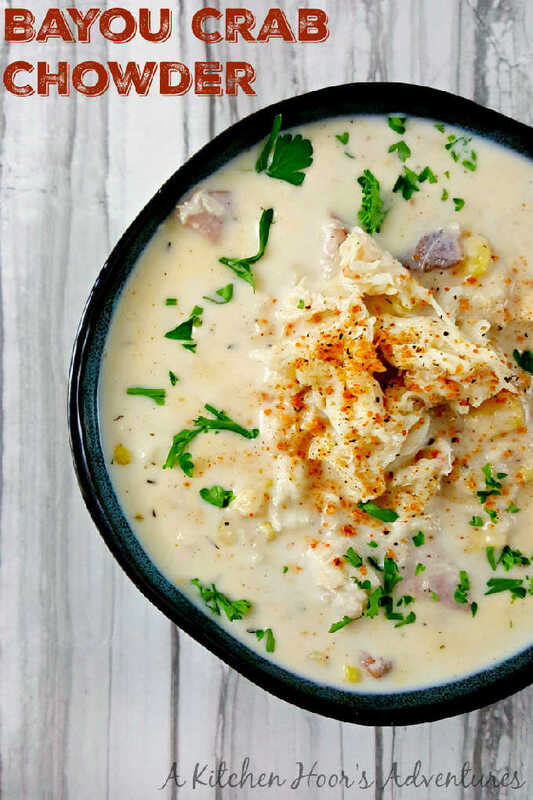 I love a good chowder, and this Cajun version is making it way to my table this week! Just added the ingredients to my list! I hope you like it! It was delicious. I added it to the menu next week. Excellent recipe! Just made it. Altered a bit…fresh potatoes, 3 to 1 veggie broth to chicken (didn’t have enough…oops). Wife loved it. Thanks for sharing! Have you ever tried the recipe with seafood broth instead of vegetable? Just curious. I have not because I don’t eat enough seafood to make my own broth and don’t know where to purchase pre-made broth. Go for it if you’ve got it. I bet it would taste amazing. I am from South Louisana. We never made chowder. Just Gumbo. When we moved to Ma., I finally experienced chowder. Your recipe for chowder reads good. Just wish you would change the title. I think of it as a mashup between the two types of cuisines. Love it! Typos totally get the best of me sometimes. I used the canned crab meat. Typically it’s Phillips brand or Chicken of the Sea in the refrigerator section. Not the canned crab in the canned meat aisle. I just finished making thie chowder. It is…..WOW! I’m so glad I tried it! Amazing flavors! I did add some Johnnys seafood seasoning and some Old Bay. I also used potatoes from my garden and some fresh lemon thyme. I’m so glad you like it! It’s one of our favorites. Potatoes from your garden? I’m impressed. why do you have sooooo many pictures of the bowl of soup? Because it was delicious and I wanted to show it off! This looks amazingly delicious! I can’t wait to test it out! Thanks for the recipe! HI, I want to make this for a cajun dinner party…since I have some time I would like to do the less “weeknight” version of this recipe, do you have it or know where I can find it?!!? I hope you enjoy this! It truly is a recipe that can be made any day of the week. It doesn’t take too long to cook up. Depending on the bowl, it’s either 6 or 8. In your ingredients you had frozen potatoes. Is that hash brown? Hope this doesn’t sound dumb. I leave in Texas so may not have variety compared to costal areas. Donna, good question! In my WalMart it’s in the potato section of the freezer where the fries are. They’re Ore Ida home fries or something like that. I plan on making this Tomorrow and can’t wait.. the crab I have is uncooked.. how am I supposed to cook it?!? Lauren, I would steam them before you shell them. I hope you love it as much as we did! I made this recipe this evening, wow, just wow! It was easy and amazing. My mods: fire roasted corn and 6 pieces of bacon vs 4. A new staple in this household! I’m so thrilled you loved this recipe! It truly is delicious as it looks. Thank you!! Ummmm…this looks delicious! Thanks for sharing and making it easy! Thanks, Linda! It was delicious. I am definitely putting it on the menu again. What is the nutritional breakdown for this fabulous recipe? Patty, I’m not sure, but you can check either Yummly (which is sometimes off) or find an online nutrition tool. Made this for dinner last night and it was awesome! THANK YOU SO VERY MUCH FOR SHARING. On the way to the grocery store !!! YAY! I hope you enjoy it as much as we did. I’m going to have to try this. It looks delicious, Christie! I hope you do, Barbara! It truly was some gooooood chowder. Thanks, Jess! It was amazingly delicious! I hope you try it. oooh that chowder looks good! Thanks, Debra! It was!! I may have to make it again. This looks delicious! I’ll have to try this the next time I have fresh crab. It’s definitely full of crab and super tasty. I hope you like it. Wow, this chowder looks so delicious, love your sharing, thank you! Thank you! It was so good and full of crab meat. I hope you like it.